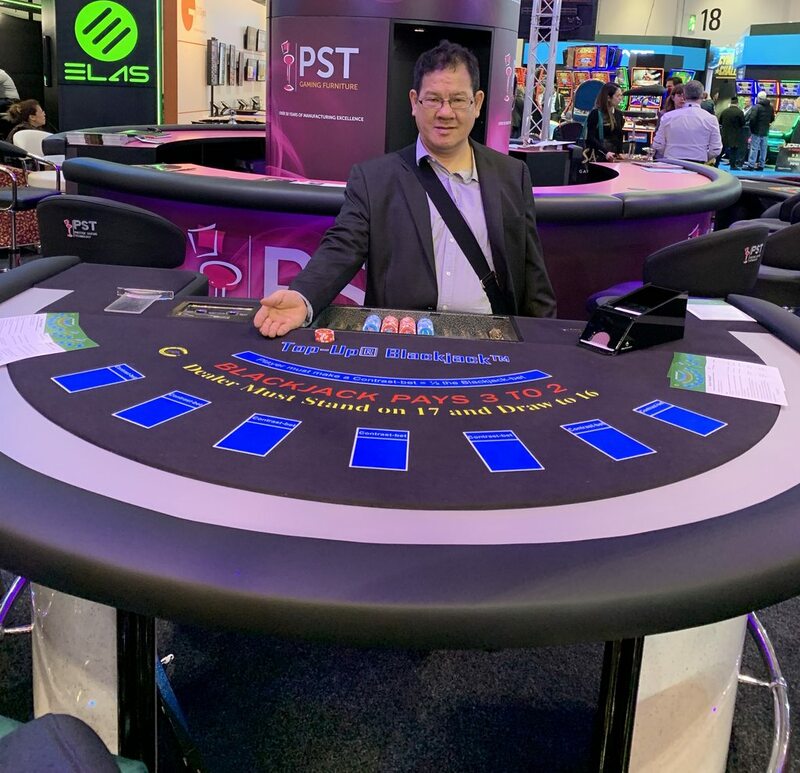 Photo from ICE-London 2019 in My Join-PST Booth. .
* Top-Up® Blackjack™ is a liberal version of Blackjack which matches 1/2 the cost of Players Split and Doubles, in Real Money. ​* Player’s Blackjack is an Automatic-win, Pays 3 to 2. ​* Player’s 21 point is an Automatic-win, Pays 1 to 1. 1. Each Player must make both a Main-wager and a Contrast-wager equal to 1/2 his Main-wager. 2. Each Player receives two cards face-up and the Dealer receives two cards with one face-up. 3. If the Player’s two-card hand doesn’t contain one Red-suit and one Black-suit, then his Contrast-wager automatically loses. 4. Play continues as normal Blackjack. 5. For all allowed Splits and Doubles, the Player only wagers 1/2 the Main-wager, and receives a Top-Up of the other 1/2 directly from the rack. 6. Any Contrast-wager stay with the original hand on a split. Player does not match his Contrast-wager while splitting. a. If the Player wins on his hand, his Contrast-wager (if any) wins 2 to 1.
b. If the Player pushes on his hand, his Contrast-wager (if any) will push. c. If the Player loses on his hand, his Contrast-wager (if any) loses. * The Question is what do you think about (Top-Up® Blackjack™) and why? P.S. Any Comments are Welcome Good/Bad. Sounds interesting. Would be curious to know the rough house edge and how strategy changes vs. standard BJ. Sounds like a good game. Is there is a version that you can double on any two cards (inc. DAS)? If yes, would correct strategy be to double and split pretty aggressively on hands where the Contrast-wager had automatically lost, and play close to a "normal blackjack" basic strategy for when the Contrast-wager was still in play? For example, if the Contrast-wager had automatically lost, can (and should) you double a hard 12 against a 6? Anyway I will answer your questions here next week. ...For example, if the Contrast-wager had automatically lost, can (and should) you double a hard 12 against a 6? 2-A***; If playing "American" (Dealer Peeks for BJ), though I haven't checked what the "no-hole card" basic strategy variations are yet. Lastly, I won't do anymore until I find out if there is a version where you can double on any total (even after splits) and what the dealer peeks rule is. What happens if the player pushes that second hand that they receive the "top-up" on from the rack? Does the player retain that half unit top up or is that surrendered back to the house? DOUBLE ON ANY NUMBER OF CARDS (on any Soft/Hard total of 9, 10 or 11 Only) and H17. Also, Once the Top-Up money is wagered, it is owned by the Player. The player receives the total proceeds from the outcome of the hand. Thus, a player will profit 1/2 his main-bet from tying the Dealer on a Top-Up double or split. Once the Top-Up money is wagered, it is owned by the Player.